We're across the causeway at the island republic’s biggest annual art initiative, a nine-day celebration (from January 19 to 27) of the visual arts jointly organised by the National Arts Council, Singapore Tourism Board, and the Singapore Economic Development Board. Here are snapshots of the SAW through our eyes. 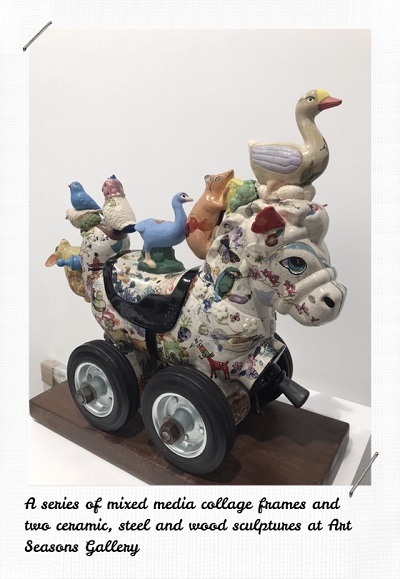 We arrived in Changi Airport and headed straight to The Private Museum for Of Dreams and Contemplation, an exhibition of a selection of works from Malaysian gallerist Richard Koh’s personal collection. The curation gave insight into the intimate reflections of the collector, like a landscape of memories framed. 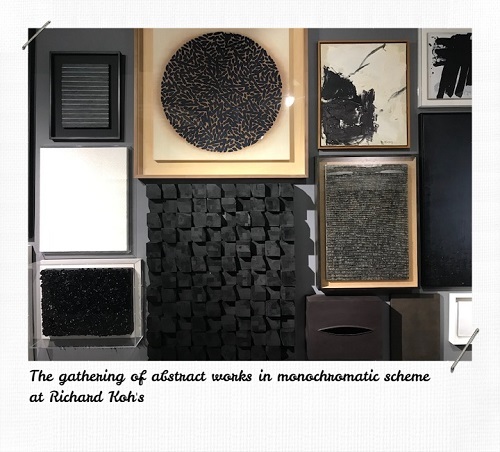 The gathering of abstract works in monochromatic scheme (pictured) also unintentionally creates a new visual, a configuration Koh himself confessed he loves and brings new dimensions to the art pieces. Next, we moved on to the Gillman Barracks — a former army barracks turned art enclave — for a preview of the inaugural S.E.A Focus art fair. 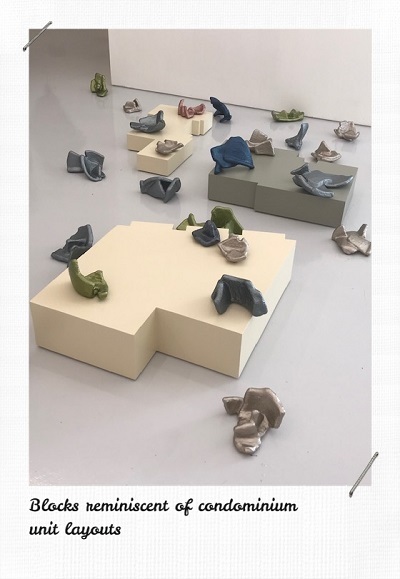 But just before that, we quickly swung by the Richard Koh Fine Art gallery within Gillman for a chat with Haffendi Anuar, who opened his 5th solo exhibition on the same evening. This piece in particular, stemmed from his observations of the confused, messy and fragmented state of Malaysia post-GE14. With the blocks reminiscent of condominium unit layouts, there's also the connotation of broken dreams, or on a more positive note, pieces of a puzzle waiting to be put together. 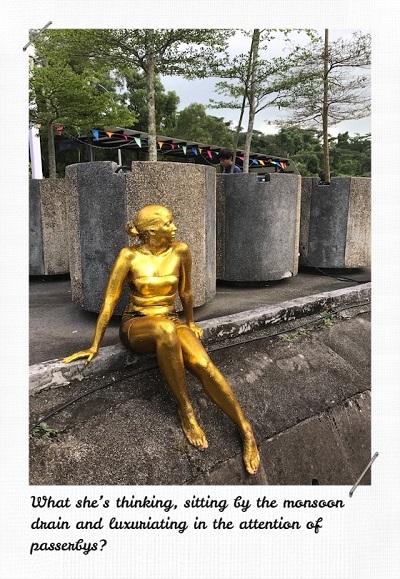 Talk about taking it public — one of the public art installations at S.E.A Focus is Diabethanol (2018) by Indonesia-based artist Julian Abraham ‘Togar’. Inspired by current issues of health, environment and technology, the artist has created a fictional company that offers a “solution” of transforming a health condition into positive impact on the environment. 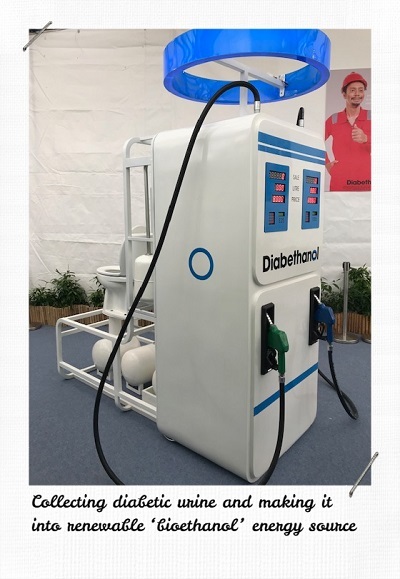 With a hint of cheekiness, the idea of mengambil kesempatan dalam kesempitan (benefitting from misfortune) becomes an imagined scheme of collecting diabetic urine and making it into renewable ‘bioethanol’ energy source. One of the highlights of the fair is definitely the performance art programmes. Here’s a golden moment when we walked out of one of the tents to get to another. We wonder what she’s thinking, sitting by the monsoon drain and luxuriating in the attention of passersby? 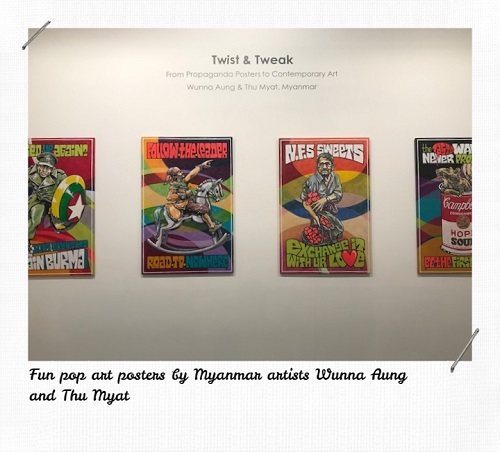 Amidst abstract and conceptual works are these refreshing and fun pop art posters by Myanmar artists Wunna Aung and Thu Myat. As the title states, the idea comes from a prevalence of propaganda posters in Southeast Asian history, particularly during the wars in Burma then. Another performance art presented in conjunction with the opening of S.E.A Focus is the rather entertaining albeit bizarre one by Philippines artist Yeo Kaa. WUD YA DO IT reflects angst and vengefulness in a decidedly urban and young tone, with the contrast of the theme and cutesy images rendered in pastel palette providing a fun, jarring experience. Found in the Art Seasons Gallery booth is a series of mixed media collage frames and two ceramic, steel and wood sculptures by Malaysian artist Umibaizurah Mahir Ismail. Always a pleasure to stare at and take in the many symbolisms, the sculptures in particular was a nice change from the various canvas art pieces that dominate the fair. 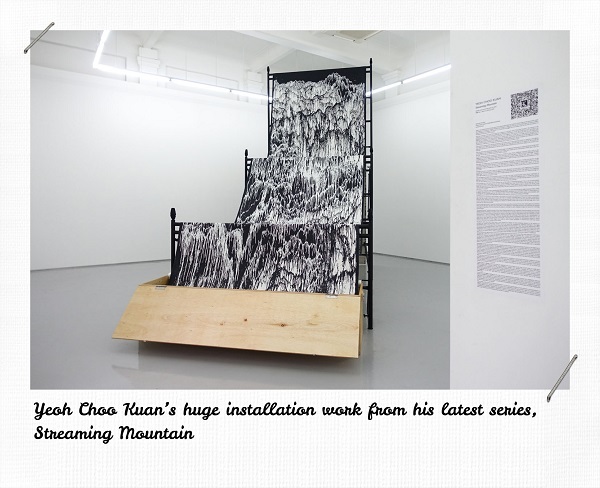 In a separate room next to the Mizuma Gallery is another Malaysian artist, Yeoh Choo Kuan’s huge installation work from his latest series, Streaming Mountain. Originally meant for Art Stage Singapore, the long canvas – inspired by traditional Chinese ink painting – is a visual treat of cascading paint. Also very Instagram-worthy. Stay tuned for more highlights from the Singapore Art Week.